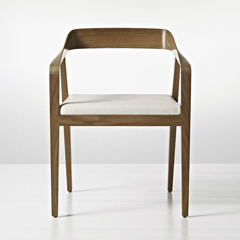 The Full Twist wood-back guest chair appears to have a frame formed from flowing ribbons of wood, but the illusion can be attributed to Geiger's state-of-the-art wood sculpting capabilities. The frame hugs the sitter's back, providing comfortable support. The seat cushion can be upholstered in nearly any textile or leather, and the wood frame, available in solid hard maple or American black walnut, can be finished in Geiger's complete portfolio of wood colors, from champagne to espresso.